“No Container, No Label” an electrical sensing device avoids wastage of labels. It also helps in keeping the unit neat and clean. Quick change of speed or the adjustment of the complete system and synchronization is possible automatically with the help of % speed pot on operating panel. Suitable for OVERLAP LABELLING where the length of label is more than the circumference of the container. Imported Gear box and AC drive. “No Container, No Labeling” System. 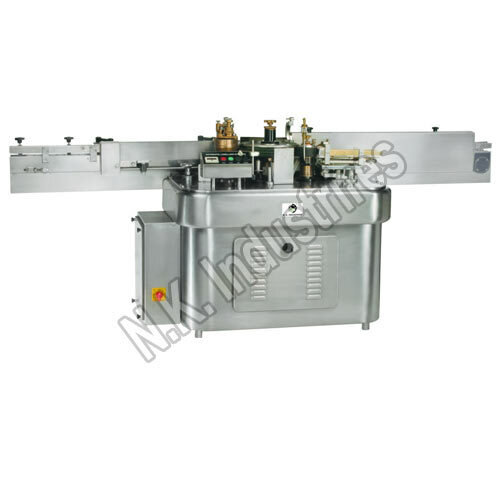 NHL 150 Automatic Wet Glue Labeling Machine is used for labeling of containers. The round container is transferred on the moving conveyor from the inbuilt Unscramble and positioned accurately by a Feed Worm for correct spacing between two containers for wrap round operation at the labeling point. The rotating GLUE CYLINDER receives cold glue from the Glue pot which subsequently gets transferred on to the Glue Rubber Roller. Finally a fine, even and thin film of glue is transferred on to the Gluing Pad. The round container on the moving conveyor at the feed worm accurate sequences switch which results in the oscillation of the label box. The rotating GLUING PAD which is aligned with oscillating LABEL BOX picks up only one label each time. The PICK-UP CYLINDER receives labels with help of pick-up fingers from the GLUING PAD. The PICK-UP CYLINDER holds the labels perfectly due to vacuum during its rotational movement. Simultaneously the pick-up fingers move inside. The round container which is positioned by the FEED WORM at the labeling point is now wrapped around with the glue label when the round container rotates by virtue of strip belt of the PICK-UP CYLINDER. Finally the moving container further passes through a rubber PRESSING BELT which ensures neat and perfect fixing of the label. 0.50 HP for Vacuum pump.